This orchid is another subspecies of Ophrys sphegodes - Early Spider Orchid - and is part of a highly variable complex group of orchids found throughout Europe. 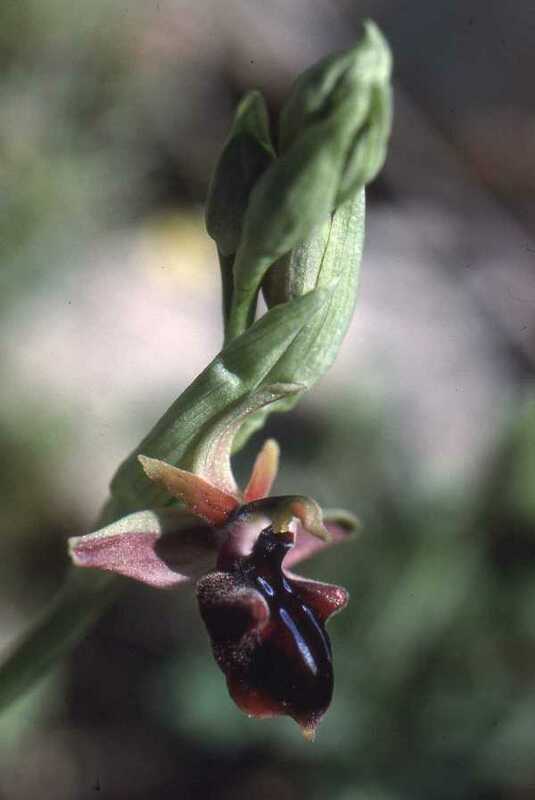 Ophrys mammosa is a robust plant growing up to 70cm in height. Each lax inflorescence carries up to 18 flowers. The sepals and petals are olive green marked with brownish-red but the two lateral sepals are distinctly bi-coloured, the upper part being green and the lower a dark red. The lip is usually a dark brownish-red and occasionally has a yellow margin. The shiny speculum can be H-shaped, or consist of two vertical stripes which are parallel to each other. This orchid is distributed in central and eastern Europe. It's range includes the Balkans, Greece, Turkey and Cyprus. Ophrys mammosa grows on alkaline soils in full sun to mid-shade. Open woodland, short-sward grassland and scrub are all suitable habitats. From mid-March to the beginning of May. The specimen shown on this page was photographed in Crete.